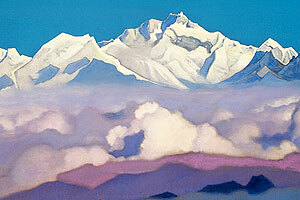 The Museum collection comprises 210 paintings by Nicholas Roerich. All of them are presented here and you can browse through them in two different ways. The thumbnails view allows you to have a birds-eye view of the collection. The images are displayed in chronological order, left to right. There you can click on separate images which will then open at the top of the screen in a larger size with detailed information. To access other paintings, you can continue clicking on the thumbnails, which are positioned below the larger image, or you can use previous/next buttons, which are placed on both sides of the larger image (use mouse-over), and also to the right of the image at the top. You can also search for a painting by starting to type any name in the search field at the top of the screen (results will start appearing after first 3 characters). 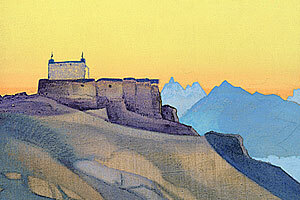 All the paintings whose titles contain the expression you entered in the search field, will be listed below it. Then use the mouse or, better, the up/down arrow keys on the keypad to scroll through the list and look at the corresponding paintings. Press the return or enter key (or click on the title from the list) to open the image and display the data. When you have finished and want to exit this view, press the close button at the right top. The table view allows you to access all the date in one place. Upon opening the view, some of the columns are hidden, but you can show/hide any columns at any time: use the controls at the top of the page. You can also sort the column contents (sortable columns display the sorting icon in the header) by clicking on the corresponding header. Use the search field to limit the paintings displayed to those, whose data contain the phrase that you enter into the search field.